Hart Island 'Memory Card' for Louis Haggins Jr.
On Nov. 29, 2004, a service was held in the Chapel of the Episcopal Church of the Holy Apostles, Manhattan, in memory of homeless leader Lewis Haggins Jr., 48, co founder of Picture the Homeless, He died Dec. 23, 2003, and was buried in Potter's Field, Hart Island, as a John Doe in February of 2004. 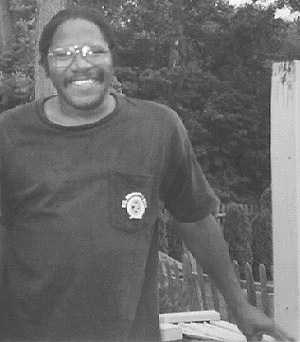 His body was not identified by the NYPD until August, 2004 at which time the Haggins family was notified. In December 2004, on the evening of the winter solstice, known also as the longest night of the year, the fourth annual Homeless Memorial Day service was held in Judson Memorial Church, Manhattan, and dedicated to the memory of Lewis Haggins Jr. and all homeless New Yorkers who were buried that year. Picture The Homeless, the organization that Lewis Haggins and Anthony Williams founded in the fall of 1999 co-sponsored both memorial events. Lewis Haggins Jr. was born in Princeton. Later his family moved to Lawrence Township, N. J., where he attended the local elementary and high schools. After high school, he worked at various jobs in New Jersey -- a training school for boys in Skillman, the Okinite Cable Co., Trenton State College and Rider University. He was very involved in music and helped form a band E.B. and the Stonewall band. In later years he moved to Harlem. "Lou," who was known for his love of writing, sometimes put on plays with the help of friends and, with their help, would put his lyrics to music. Lewis and Anthony met at Bellevue Men's Shelter in Manhattan, where both were staying in the fall of 1999 during the period when the city administration stepped up law enforcement on the homeless in the wake of a woman pedestrian being violently attacked by a stranger using a brick to assault her without apparent provocation. Because much of the media and many of the public statements about the case presumed the attacker was homeless, Haggins and Williams decided that something had to be done to change the public perception of homeless people in order to find real solutions to homelessness, including the constructive participation of homeless New Yorkers. They founded PTH as an organization by, of and for the homeless. Sometime later, PTH adopted as its motto: "Don't Talk About Us, Talk With Us." Family members said they learned from police in August 2004 that "Lou" had died eight months earlier in a Brooklyn hospital to which he had been taken after being found unconscious on a train in Brooklyn. Because he apparently had no ID on him, his fingerprints were taken after his hospital admission and eventually these reached the desk of a detective who submitted them for a fingerprint database search. A match with an old trespassing arrest record established the prints belonged to Lewis Haggins Jr. As a result, family said, they were informed of his death and that he had been buried in Potter's Field Feb. 25, 2004. Besides lifestyle-related chronic health issues, the listed causes of death included pancreatitis and cardiomyopathy. "Lou" is survived by his parents, Lewis and Geraldine Haggins Sr.; his brother, Brock; his twin sister and brother-in-law, Lois and Jonathan Funderburg Jr., his nephew, Jonathan 3rd, and his niece and godchild, Lauren Funderburg. PTH's involved and active interest in the hardships that the homeless encounter in life has been drawn and extended by its co-founder's death and his Potter's Field burial to the hardships encountered after the death of the homeless; in particular, concerns related to body identification, family notification and dignity for the interred. The Haggins family has joined with PTH in beginning that process. 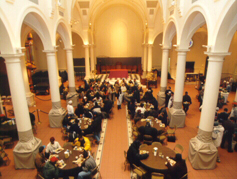 The Holy Apostles Soup Kitchen (image above) co-sponsored the Nov. 29, 2004 Lewis Haggins memorial service in the Chapel of the Episcopal Church of the Holy Apostles. The landmark church at the corner of 9th Ave. and 28th St. dates from the 1840s. The Holy Apostles Soup Kitchen, organized as such under that name in 1982, is part of the church's long history of outreach to the needy of the city. Above, based on PTH website images, from left: Brock Haggins speaks of brother Lewis. Rev. Carlton E. Branscomb leads the group in prayer. Lewis' coffin in the NJ cemetery. Jean Rice and Leroy Parker of PTH participate. Click panel for larger orginals and other related PTH images. 'PICTURE THE HOMELESS' CO-FOUNDER COMES HOME TO N.J. After disinterment from City Cemetery, Hart Island, the Bronx, reburial took place in Franklin Memorial Park, North Brunswick, N.J., Oct. 27, 2006. The Rev. Carlton E. Branscomb of the First Baptist Church of Princton, N.J. officiated. The service was private. Only family and close friends participated. A simple plaque serves as a marker at the grave. The family intends to replace that with a gravestone in the near future. The Hagginses, who provided the details for this update, asked to express through this note "thanks to everyone who helped us gather information for the disinterment of Lewis Haggins Jr."
Below, based on PTH website images, from left: PTH director Lynn Lewis embraces Lewis Jr.'s mother, Geraldine. The Hagginses in front row: Brock, Lewis' second cousin Frankie Hines, mother Geraldine, father Lewis Sr. and Lois Funderburg, Lewis' sister. After service, Lois with Emily Givens of PTH. Click panel for larger orginals and other related PTH images.